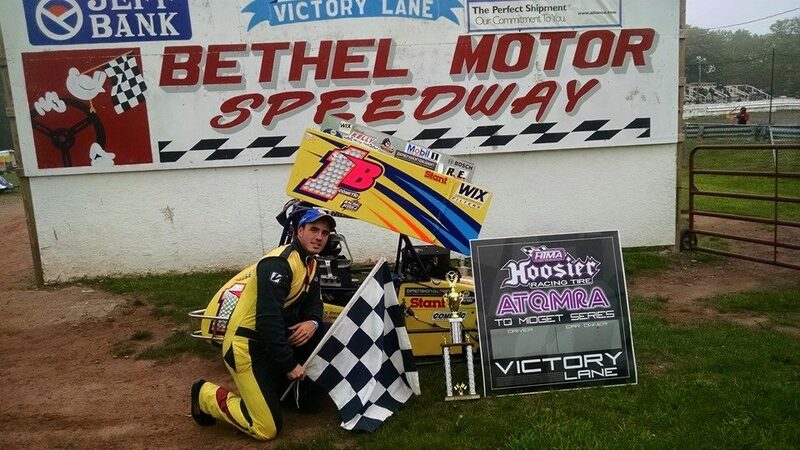 Bethel, NY 6/20/2015 Flyin' Ryan Tidman Tops the competition at Bethel Speedway for back to back wins notching wins on the longest and the shortest tracks on the schedule in consecutive weeks. 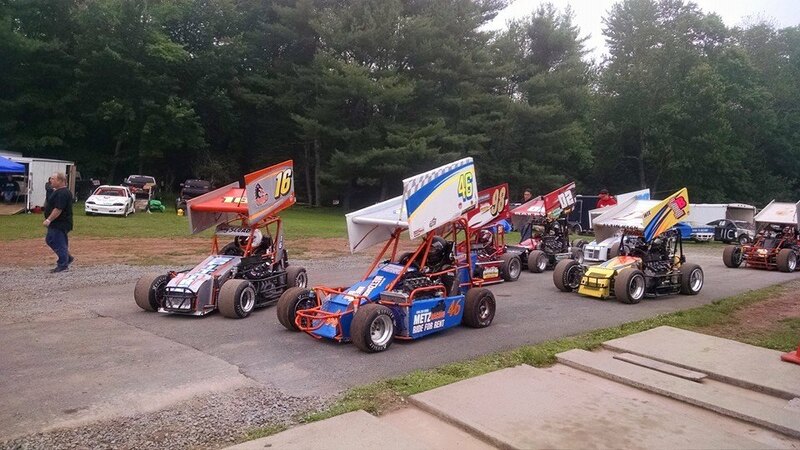 The TQs were able to get the races in battling threatening rain all day. Mark Pritchard and Bill Force Sr. won the Vintage TQ portion of the races. The ATQMRA had the Metz Racing 46 on display at the Teterboro NJ Wings and Wheels Show. Next up for the ATQMRA is the first ever race on the Wall Stadium Inner oval on July 18th. Under the threat of rain all day the Thunder and Lightening Division TQ midgets didn't disappoint. A front row of Geoffrey Sutton and Buddy Sload brought the field to the green flag with Sload working his way into the lead from the outside pole starting position. Sload was followed into the lead by Tidman who went to work annexing the top position from Sload. Tidman was able to get grip on the bottom pulling along side Sload making a 2 wide battle for the lead. The pair raced side by side until lap 6 when Tidman was able to close the deal and take the lead. The story doesn't end here. Sixth starting Joey Bailey worked his way into second on lap 10 and set his sights on Tidman who was clearly the class of the field this day. Always the gamer Bailey was able to use a late race caution to give him a chance to get to the front. Bailey's attempt to get the lead left the door open for Sutton to take second position on lap 22. The pair of recent ATQMRA Rookies of the year swapped slide jobs and cross over moves down to the last lap with Bailey crossing the line second and Sutton third. Nick Ladyga made his ATQMRA debut in his beautifully prepared Laffler number 38 and earned an impressive fourth place finish after turning in some of the fastest laps of the day in practice. He missed the tune for the feature and battled to get the car in top form. It was a crap shoot on making the final adjustment for the feature after the track was dried and the TQs ran feature only to ensure the traveling group was able to get their show in. Special thanks go out to the Bethel Management team for getting the show in. The Vintage TQs were on hand with Mark Pritchard earning Victory in the 2 Stroke and Bill Force Sr. winning the 4 cycle division. Next up for the ATQMRA is its first foray onto the inner oval at Wall Stadium for some flat track wingless racing. 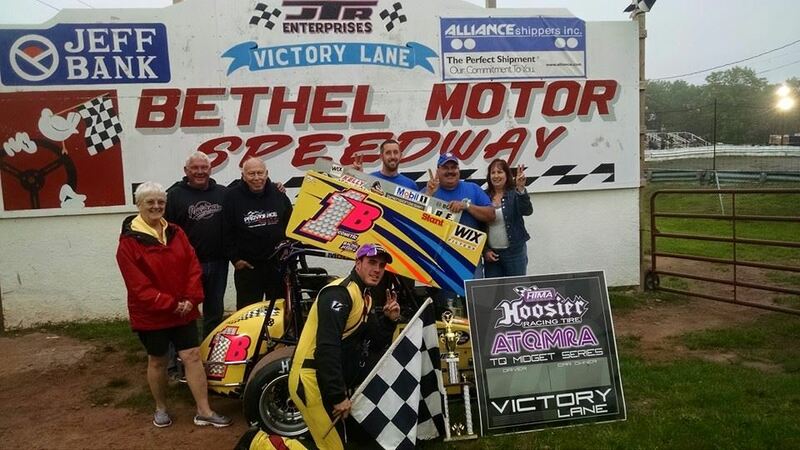 Tidman's resurgent hot streak should help him carry momentum into the next race on the tight confines of Wall's flat inner oval on July 18th. Blu Metz and Micky Soto-Metz had the Metz racing 46 on display at the Teteroboro NJ Wings and Wheels Expo and provided big wheels for children young and old to race on behalf of the Hoosier Tire ATQMRA. ATQMRA News and Notes: The Force Family celebrated Fathers day weekend at the races with the elder Force having the best day in his vintage car. Force Jr. and Patrick Force were relegated to a DNS's on the day. Patrick broke a rear in practice and Force Jr. was sidelined by electrical issues. It appears that Mike Glaser was able to take advantage of Force's mechanical whoa's and make up the points deficit from missing the first race of the year turning the rookie battle into a horse race. Ryan Tidman helped his chances of earning the MNO season long Passing bonus by advancing from his fifth starting position to earn the victory. Hot Rod Jon Gambutti was sidelined after the engine in the Alan Mollot 51 Badger expired in practice. Feature 25 laps. 1. 1B Ryan Tidman 2. 02 Joey Bailey 3. 46 Geoffrey Sutton 4. 38 Nick Ladyga 5. Matt Roselli6. f8 Mike Glaser 7. 16 Buddy Sload 8. 53 BJ MacDonald 9. 51 Jon Gambutti 10. Patrick Force 11. Bill Force Jr.